The electrical control of SIGMA asphalt plant is handled by the sophisticated automation and control system located inside a comfortable control cabin with insulated walls and air-conditioning. SIGMA automation system enables the control and management of all functions and production stages of the asphalt plant automatically through the user friendly software, personal computer and programmable logic control system. High quality and reliable standard electric and electronic components are used inside the switching boards. The plant control system can be remotely accessed via modem, so that when necessary, plant functions are analyzed and problems are solved by SIGMA after-sales support engineers. The plant graphics on the computer screen are simple and all processes are easily controlled with clicks of the mouse. 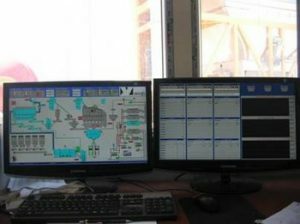 The instant status of the plant, operational parameters and alarm messages can be visualized online on the monitor along with several reports concerning the parameters, production and consumption data which can be printed as well.